There are Poinsettias in the Church, and if anyone wishes to purchase one in memory of a loved one, please see Senga Booth. The plants will be available for uplift after the service on the 20th or on Christmas Eve. The North Primary School is having its Christmas Service in the School Hall on Wednesday 16th December at 9.45am. Anyone from St. John's wishing to attend should let Bob Docherty or Mary Struthers know as soon as possible. The December issue of the Church Magazine, The Echoes, is now available. know exactly when this will be. He hopes you enjoy reading this over Christmas and wishes you a Happy Christmas and a prosperous New Year. The Gilbert and Sullivan Society are holding a Christmas Fair and Car Boot Sale on Saturday 5th December from 10am to 2pm in the Methven Hall. Teas will be served. There is to be training course at Burntisland Parish Church on Saturday 12th December from 8.45 to 11.45am for all volunteers who are currently on the Church's Register of Children's Workers. If you would like to attend this course please inform Bob Docherty or Dianne Waddell who will book your place. The last walk before Christmas will take place on Sunday 29th November leaving the church at 12.30pm. We'll start from the church and head for Dysart where we shall have lunch at the Harbourmaster's House Bistro. If you intend to go on this walk please let Dianne know as soon as possible so that the Bistro can be advised for catering purposes. PoppyScotland special offering raised £150.07. 144 filled shoe boxes were sent to needy children as part of Operation Christmas Child. The next Walking Group outing is on Sunday 15th November leaving the church this time at 12.30pm. This will be a circular country walk starting at Ceres, Hill of Tarvit, Bridgend and back to Ceres for refreshments. This is a challenging walk in parts and waterproof footwear is advisable. For the 5th year running, the price per copy, each month, will be £1.60. Orders for 2010 must be made known to The Life and Work office by 23th November. Any changes should be given to Ann Wooton, (01592) 262476, by Sunday 22nd November. New orders will be welcomed. Woollen squares and embroidery threads. We have sent five parcels to Kitwe, Zambia, much appreciated. Jenny sees fit to distribute them gradually to ensure that they are all used up successfully. However, the ladies in the village of Ipusukilo have unraveled the knitted squares and re-knitted or crocheted them for antimacassars..... apparently a better sale on their arts and craft stall! So thanks to the busy knitters of St. John's, but a re-think is required. Possibly sending skeins of wool, possibly via someone on home leave. 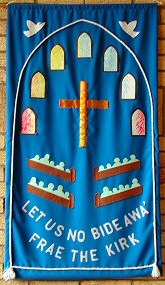 Possibly sending already knitted squares to another Church in Malwi. These situations are being explored. Thanks again for all your offers. The Christmas Fayre will be held slightly earlier this year on Saturday 14th November at 2pm. There will be the usual popular stalls for you to browse, and delicious afternoon teas available. Tea tickets are now available. Please support by attending and handing in items for sale. The baking stall will be grateful for your home baking. The hall will be open from 2pm to 4pm on Friday 13th November and from 10am on the Saturday. Helpers are always required. Please contact Grace, Margot or Senga if you can help in any way. A letter has been received from the Kirkcaldy Corps of the Salvation Army expressing their thanks for the wonderful collection of goods from our Harvest Thanksgiving Service. The Salvation Army's reputation for a "belief in action" ensures that they receive many calls from local people for help and a "food parcel". Our generous donation helps to continue this work. The special offering on Communion Sunday for Tom's Appeal, CLIC Sargent amounted to £156. This generous gift has been acknowledged by CLIC Sargent, saying that with virtually no government funding, donations for people like ourselves play an important role in CLIC Sargent. Our support ensures that they can continue to provide the much-needed services in the future. Tom and his family and everyone at CLIC Sargent say thank you very much for your support. Please bring your filled shoe box to Church on Sunday 8th November or Sunday 15th November but preferably the 15th. Boxes will be uplifted during the week beginning the 16th. If neither of these dates are suitable then please bring your box when convenient to you but before the 16th. If possible, please enclose the transport cost of £2.50 in the envelope provided and place inside the box but on top of your items. Anyone still requiring an empty covered box, please speak to Angela Stewart. The recent Gift Day has so far raised a total of over £3,393. Many thanks to all contributors for this excellent response. The next Walking Group event will take place on Sunday 25th October leaving the church as usual at 1.00pm. The walk starts in Falkland village, through the estate, Maspie Den and the Yad waterfall and stopping at the Pillars of Hercules for refreshments. This is a beautiful walk on mainly good terrain but a little testing in parts. All are welcome. The August issue of the church magazine "The Echoes" is now available online. The final issue of the year will be published at Christmas. The deadline for this issue is Sunday 8th November. This may be the last edition of the Echoes so let's make it a good one! I'm looking for the usual mix of stories, jokes, congregational items and items of wider interest. Contributions may be placed in Tom Harrows pigeonhole. Our Interim Moderator, Rev Alex Forsyth, will have a Vestry Hour from 6.30-7.30pm on Tuesday 6th October. Anyone requiring to meet with the minister at this time please inform Bill Stenhouse on (01592) 265080. The Guild will be hosting two special events in November. As a celebration of their 80th birthday, a dedication service will be held during the service on Sunday 1st November at 11am. They are also holding an Afternoon Tea on Wednesday 4th November from 2-4pm. Tickets are priced £2 from normal sellers. Kirkcaldy Gilbert and Sullivan Society have started rehearsals for next year's production of "La Vie Parisienne" by Offenbach and seek new members. Rehearsals are Tuesday 7.30-9.30pm in the New Hall. Please come along and join us. For more information contact Lia on (01592) 566353. The country walk season has finished but we'll continue to walk every 3 weeks or so over the cold months, but stay to well known tracks and towns. The first of these town walks of approx 3.5 miles, a 'Mystery History Walk', will be led by our own Enigma Docherty and walkers should meet at the church at 11.30am on Saturday 3rd October when a minibus will be used. Includes a Coffee stop. The Harvest Thanksgiving service will take place on Sunday 20th September. Donations of non-perishable goods can be brought along on the Sunday or, if you wish, can be handed in on Friday 18th between 2pm and 4pm. These gifts will be given to the Salvation Army for distribution. If anybody would like to come along and help decorate the church please come along on Friday 18th at 2pm. The first meeting of the Women's Group on Tuesday 8th September has been cancelled. The new season will now begin with on Tuesday 22nd September at 7.30pm with a games/quiz night. New members very welcome. You are invited to take part again in Operation Christmas Child which sends a message of hope to children in desperate situations around the world through gift filled shoe boxes. Covered shoe boxes are available in the church vestibule and an instruction leaflet is inside each box. Please aim to have your box filled by the first week in November but a definite date will be given later. Please make a child smile at Christmas. This scheme is in conjunction with Samaritan's Purse who are a nondenominational evangelical Christian organization providing spiritual and physical aid to hurting people around the world. Graphic: ©2008 Samaritan's Purse. All rights reserved. Used with permission. Join the BB! The 2009/10 Boys' Brigade season kicks off with an Enrolment Evening on Thursday 3th September for the following sections: Anchor Boys (ages 5-8) and Junior Section (ages 8-11) at 6.15pm, Company (ages 12-14) and Senior (ages 15-18) Sections at 7.30pm. All new boys who wish to join will be made very welcome. The JC Club will be starting its new season on Sunday 6th September during the morning service. All children who would like to come along will be made most welcome. Simply meet in the Methven Hall prior to the service. The concept of Healing Rooms was explained by one of our Directors Dianne West, at Presbytery in March. It is an outreach to the community offering prayer for everyone who desires it. The prayer might be for physical, mental, emotional or spiritual healing. We are simply directing people to the Lord Jesus Christ who is the Healer. A team of people from different churches across the area has been meeting for many months to pray and seek the Lord's Will about starting a branch here in Central Fife. Anyone who is interested in discovering what the Healing Rooms is about, or wishes to be involved, is welcome to join us on Saturday 5th September for the Training Day. Contact details can be found on the poster on the notice board at the side ramp door or speak to Mary Sherrard. Do you have any old spectacles lying in a drawer? If so, you could be helping millions of people in the developing world who simply need spectacles to lead a normal life. Vision Aid Overseas is a charity who send teams of volunteer professional Optometrists and Dispensing Opticians who carry out eye tests and provide spectacles appropriate to the patients needs. A green box is in the vestibule and all old spectacles will be gratefully received. Choir practice sessions resume on Thursday 17th September at 7.15pm in the New Hall. Any new members will be most welcome. Although our totals are very slightly down this year, St. John's has still raised a large amount for Christian Aid. Thank you very much to all those who helped and to those who supported this good cause in any way. Christian Aid believes in strengthen people to find their own solutions to the problems they face. They do whatever is needed to support poor people and their communities, whether it is speaking out against the causes of poverty or funding vital work on the ground. Your generosity means that Christian Aid is currently able to support over 600 partner organisations around the world as they work towards ending the injustice of poverty. Two new walks have been announced from Balbirnie to Star and around Lower Largo. The new season of events at St. John's Church of Scotland Guild are now available. The first meeting starts on Monday 7th September at 7pm and will include Rev. Alex Forsyth as the special guest. New members are always welcome. This years Strawberry Tea season has been a big success with an amount of £1,443 raised so far. The Strawberry Spectacular during August was particularly well attended and raised £560 on the day. Many thanks to all who attended and enjoyed the events. Our first parcel of knitted squares sent out to Zambia has arrived. The ladies of the project group in Ipusukilo are very pleased. Another parcel will follow soon. Three parcels of embroidery threads have also been dispatched. Many thanks to members of the congregation for their contributions. Voting to approve the 'Basis of Union' document with St. Andrews Church will be held after the service on Sunday 23rd August. Only those present will be able to cast their vote. There will be no other opportunity to vote. The Women's Group new session starts on Tuesday 22nd September with a Games/Quiz Night. Click here for further details on their series of meetings and events. Lorraine Fairful and Ann Crawford are taking part in this event on Sunday 6th September to raise funds for St. John's Taekwondo. Sponsor forms available in the vestibule or speak to Lorraine. The Taekwondo Camp is nearly here! The camp runs from 9th to 15th August with a Tournament on the 15th. Please note change of venue to Kirkcaldy High School. The church computer service has now been restored which once again allows us to display the words for all hymns on the large screen. You no longer need to bring your books each week. The Walking Group's next walk will take place on Saturday 1st August again leaving the church at 1pm in shared cars. We're heading for Lochore Meadows this time and will walk the 3.6 mile circuit of the Loch. This is mainly tarred surface and no inclines so will be suitable for most folk. Kirkcaldy branch of the Scottish Bible Society are holding a Fiddler's Rally in Pathhead Parish Church on the evening of Friday 28th August. Please give this support and enjoy an evening of lively music. Contact Sandra Marshal for further information on 262085. We have dispatched a parcel of knitted squares to Jenny Featherstone in Kitwe, Zambia. These can be made into blankets for the children at the "orphan" farm this winter season. We are trusting in safe delivery by air-mail post - usually successful. Jenny is so grateful. She also mentions that any surplus embroidery threads could be useful to the Women's groups for making cards to sell at their craft stalls. Offers to Margaret Simpson please. The deadline for the next edition of the Echoes is Sunday 9th August. Please pass any items to Tom Harrow via his pigeonhole or via email. The Webb Ivory catalogues are now available at the front of the church and all orders should be given to Lorraine Fairful. The sponsored walk around the Beveridge Park last Sunday was most enjoyable and the weather was very suitable for walking - also suitable for lots of chatting! Altogether 14 adults and 1 dog did the walk with all proceeds going to Christian Aid. Thank you to all that took part and thank you to the sponsors. As part of the churches outreach to the community, new short services will now be run at regular intervals at the Bennochy Lodge Nursing Home. The first was held on the 5th July. The second Walking Group trip will visit Kinghorn on the Sunday 12th July leaving from the Church at 1pm via car sharing. We're heading for Kinghorn this time; a circular route from the Golf Course Pavilion, over Grangehill, around the loch past the Ecology Centre and then downhill to the town where we can have coffee at Niven's. Distance - Approx 4 kilometres. Terrain - Pebble track and farm tracks. There is an initial climb from the golf course to the caravan park but the fantastic views at the top make it worthwhile. Talk to Dianne (890560) or Rona (269712) for more information. A new Walking Group has been formed. Our first walk takes place on Sunday 28th June. Walkers will car share, leaving the church at 1pm for Letham Glen, Leven, from where we shall follow a circular route through Silverburn (4 miles). Please contact Dianne on (01592) 890560 if you intend to take part or for more information. Please return your voting form for the new church name by Sunday 21st June. They can be handed in to elders at the church door. Thanks to all who attended and/or contributed in any way to the success of the recent Quiz Night. £242.68 was raised for church funds. Due to technical problems with the church computer we will be unable to use the large screen during hymns for the next few weeks. If you have your own hymn books at home please bring them along. Copies are available in the church for those who require them. Our Interim Moderator, Rev. Alex Forsyth of Markinch plans to start a weekly Vestry Hour on Tuesdays at 7pm commencing 9th June. Any member of the congregation can meet with him at that time. This year we are again walking around the Beveridge Park on Sunday 28th June with all proceeds to Christian Aid. Make sure you get your ticket soon for St John's Church Big Quiz Night on Saturday May 30th at 6.15pm. Tickets £12 per team of 4 people are available from Dianne Waddell (01592 890560) or members of the fundraising team. Snacks and refreshments will be served and there will be a raffle and plenty of excitement on the night. Please invite your family, friends and neighbours along and let's form as many teams as we can to ensure a good atmosphere and lots of fun and fellowship at St John's BIG SATURDAY NIGHT OUT! Thank you all for delivering and then collecting Christian Aid Envelopes throughout the parish and beyond and being out in all kinds of weather. It was the opinion of most collectors this year that they did not have a good response to Christian Aid. However, the money collected amounted to £1396.69 compared to £1295.83 last year. The grand total for 2009 will be given soon. A concert to celebrate the 70th birthday of Kirkcaldy's G&S Society will be held in the church on Friday 5th June at 7.30pm. Tickets priced £4 (under 16), £7 (concessions) and £8 (adult) are available from Lia on (01592) 566353 or Anne on (01592) 595824. The concert will be a mixture of 70 years of music with popular songs from the musicals and of course, Gilbert and Sullivan. The Soup and Sweet Lunch held for Christian Aid raised £328.20. Many thanks to all who attended. The Photo Books of the Centenary Year are now available at the original price of £15 from Brian Booth. Please contact him on Sundays or via (01592) 890972. The JC Club Closing Service will be held on Sunday 24th May, with the club restarting in September. A special invitation has been received from Diane Campbell of The Church of Christ, Hayfield Road to their "Ladies Day" which will be held on Saturday 16th May. The theme for the day will be "Seasons of Life" and there will be four very able speakers. The meeting will commence at 12 noon and will begin with lunch. Any lady wishing to attend please give your name to Chris Hay. The recent Get-Together Tea Afternoon enabled us to donate £350 to the Fife Society for the Blind. Many thanks to all who contributed. If you have ordered a Photo Book, please let Brian Booth know. Nicola ordered the books but has not provided the list of names. Strawberry Teas are back hoping for better weather this year. We start on Friday 29th May from 2pm to 4pm and fortnightly thereafter until 7th August. We finish with our "Strawberry Spectacular" on Saturday 15th August. Hope to see you all over the summer months. A full Fabric Committee meeting will take place shortly to discuss and finalise the manse report. Would members of the committee who have not already inspected the manse, please uplift their copy of the manse condition report from their pigeon hole. Please contact Mr W. Stenhouse for access for inspection. Anyone fancy a tour of Perthshire? That's our destination on Thursday 21st May. If you would like to accompany us the price is £20. See Mrs Rae or any member of the Get-Together. The Bowling Club outdoor season starts on Monday 4th May at 2pm at the Gallatown Bowling Club. Meetings will be held at the Gunners Club if the weather is not suitable. There will be a meeting of the Fabric Committee at the Manse at 2.30pm on Wednesday 6th May at 2.30pm. A full attendance is requested, apologies in advance to Roddy Sellars. The Women's Group closing dinner will be held at the Lomond Tavern, Falkland on Tuesday 5th May. Members please meet at 6.45pm. The list of guest ministers over the summer period is now complete and can be found in the calendar and church services pages. The Get-Together annual Tea Afternoon is on Thursday 30th April at 2pm (just come along - minimum £1) and the Christian Aid Soup and Sweet Lunch on Sunday 10th May after the service. Tickets available now for £3.50. Due to a shortage of door-to-door collectors this year, if you have a few hours to spare during Christian Aid Week, please speak to Angela Steward who would be most grateful for your help. Christian Aid Week runs from 10th to 16th May this year. As usual, there will be a Soup and Sweet Lunch after the service on Sunday 10th May. The schedule of special services for Holy Week is now available for the town centre churches. This includes a service at 7pm on Good Friday at St. John's. The Women's Group invite you to come along and enjoy an evening of fun for all the family at a Bunny Drive on Tuesday 7th April at 7pm in the Methven Hall. Tickets £1.50, including refreshments, from group members. Brighten up the Easter holidays and come along. All welcome. A cheque for £220.45 has been sent for the use of our Missionary Partner, Jenny Featherstone, in Zambia. This will be used for project work and emergency funds. The generosity of the congregation is mush appreciated. The amount received from the sale of goods at the Fair Trade stall on Sunday 1st March was £80.37. Thank you to all who supported this good cause by buying Fair Trade products, which is a really simple way to make sure that trade is working for farmers and workers in developing countries. A fair price can transform the lives of some of the poorest people in the world. The "WWF - The Global Conservation Organisation" invite the congregation to join in the WWFs Earth Hour - a global show of concern for climate change when people, businesses and iconic buildings around the world will switch off their lights for on hour at 8.30pm on Saturday 28th March. You can find out more at their website. Sign up and switch off your lights to show world leaders that we need to act decisively on climate change. Near to home, buildings plunged into darkness will be the Forth Rail Bridge, Edinburgh Castle, The Scottish Parliament, The Scott Monument and many other buildings in Edinburgh. The people of Edinburgh will join those in 930 cities and towns in over 80 countries, across 25 time zones which will power down for WWF's Earth Hour. The annual Get-Together "Tea Afternoon" in aid of the Fife Society for the Blind will be on Thursday 30th April from 2pm to 4pm in the Methven Hall. The Guild and Get-Together annual Summer Drive will be a tour of Perthshire this year. The drive will take place on Thursday 21st May. Please contact Effie Cooper if you'd like to come along. The March issue of the church magazine "The Echoes" is now available online. The Clerk to the Board's term of office ends shortly. The post involves minute taking and the Congregational Board meets every two months. The Clerk does not need to be a member of the Board or an elder. Because of the Union, the duties could be undertaken for one year. Please consider offering if you can. The amount collected in the gift boxes for February was £50.73 making the total for the year so far to £138.33. Please keep saving your small change and make pennies turn into pounds for Church funds. The yellow gift boxes are available in the vestibule. The Women's Group are having a Table Top Sale in the Methven Hall on Tuesday 17th March at 6.30pm. Goods for sale can be handed into the Methven Hall on 17th March from 2pm to 4pm. The sale is open to any group for £6 per table. If interested please contact Irene Wood (267995) or any member of the Women's Group. Now is the time to have a good clear out. The Guild will be hosting a special concert by the East Fife Ladies Choir at 7.15pm on Monday 23rd March. Tickets priced £3 are available from Guild members or at the door on the night. Come along and listen to the ladies sing a variety of pieces from old time classics to modern day hits. Services will be held on Friday 6th March at the Salvation Army Hall, Hill Street at 2pm and at Dysart Kirk and St. Pius X at 7pm. The services this year have been compiled by the women of Papua New Guinea. All welcome, men and women, to join with the world in the theme "We are many members but one body in Christ". This is an event being held by Fife Council and Fife Fair Trade Forum in Kirkcaldy Town House on Thursday 26th February from 6.30 to 8.30pm. Special guest is Towera Jalakasi, Business Consultant, Africa who will speak about Fair trade in Malawi and the effect it has on people's lives. Also Betsy Reed, coordinator of the Scottish Fairtrade Forum will talk about the Fair trade scheme in Scotland. Everyone is welcome. Fair trade stalls and refreshments will be available. Fairtrade Fortnight this year is from February 23rd to 8th March when we try to tip the balance in favour of poor farmers and workers. You can help by taking action during Fairtrade Fortnight and throughout the year. There will be a Fairtrade stall in the church vestibule on Sunday 1st March. Please give your support. With Mothers Day coming up, why not buy some Fairtrade flowers this year (available from certain florists). The Induction Service for Nicola at Ardler, Kettins and Meigle will be on Wednesday 25th March starting at 6.30pm. A coach is being organised to leave St. John's at 4.30pm at a cost of £9 per person. If you would like to go please add your name to the list available in the vestibule as soon as possible. Nicola has compiled a photobook highlighting some of the events and activities from our centenary year. This will be available for people to look through in the Methven Hall. If you would like to order a copy the cost is £15. An order form will be available by the teas and coffees. There will be a finger buffet after the service on Sunday 15th March to say "Farewell and Thank You" to Rev. Nicola Frail. All are welcome to attend. There will also be holy communion during the service with the usual crèche facilities available. The Boys' Brigade Cairn, in the Church Grounds, will be topped out on Sunday 8th March when a time capsule will be placed inside. The recent RNLI SOS Fundraising Day realised over £670. Senga Booth would like to thank everyone for their tremendous support in achieving such an acceptable result. Without the fantastic help of the friends at St. John's, this would not have been possible. Deadline for Spring Issue of the "Echoes"
The deadline for the spring edition of the Echoes is Sunday 15th February. Early submissions would be much appreciated. Please leave contributions in Tom Harrow's pigeonhole or send by email to the church office. The Taekwondo Club will be hosting the annual European meeting of the World Traditional Taekwondo Union (WTTU) from 8th to 15th August. This major event will bring students from various European countries to Kirkcaldy. Instructors will be flying in from America and Thailand to guide and test the students in the art of Taekwondo. To meet the costs of this exciting event, various fundraising activities will take place during the year, including a Kickathon, and sponsorship opportunities will be available on the official event T-shirts! Please contact Nicola for further information on sponsorship details. St. John's minister, Rev. Nicola Frail, has been accepted as the new minister for Ardler, Kettins and Meigle. This rural parish spans three villages midway between Perth and Forfar and includes the churches at Kettins and Meigle. Subject to Presbytery acceptance it is likely she will be leaving us on the 15th March. As part of Kirkcaldy Presbytery’s review of churches in the local area, a union between the congregations of St. John's and St. Andrew's Churches in Kirkcaldy is to be formed. Discussions will be starting in February to shape the basis of this union and further news will be provided when available. Could anyone help with the flower delivery rota please? The dates for 2009 are 5th April, 28th June, 20th September and 13th December. These dates could be shared; for example, four people could do one Sunday each, or two people could share the four dates. Please think about it and contact Helen Wishart if you can help out. The Prayer Group are holding their first meeting of 2009 in the Prayer Room on Wednesday 21th January at 10am. Once again we would ask that members of the congregation use the prayer slips in the vestibule or in the Prayer Room for friends or relatives whom they wish to be remembered in prayer. Be assured that any prayer requests are treated with 100% confidentiality. We speak to God, not to anyone else. We are a small group at the moment and would welcome new members to join us for an hour on Wednesday mornings once a month. There are still some Sundays available on this years flower list. Please add your name to the list in the vestibule if you wish to provide flowers for the Sanctuary. Senga Booth, with a lot of help from friends at St. John's, is holding a tea afternoon, "Sponges or Scones" in the Methven Hall from 2pm to 4pm on Friday 30th January for the Royal National Lifeboat Institution SOS Day. The RNLI receive no government funding, and all lifeboats are crewed by volunteers who do a great job rescuing people around the coast of Britain, usually in treacherous conditions. The Firth of Forth is one of their busiest areas. SOS - Sample our scones or sponges. Tickets on sale now £2.50 from Senga or pay at the door. What a magical way for St. John's Church to end its centenary year. We've had concerts, demonstrations, an exhibition, a flower festival, a celebration of 125 years of the Boys' Brigade, a visit by the Moderator of the General Assembly along with quite a number of other activities. To crown all these things - on the last day of the old year we learn that our senior elder and captain of the Boys' Brigade has been awarded an MBE in the New Years Honours List. As a church we are absolutely delighted for John. The award could not have gone to a nicer and more dedicated person. Very well done John!